Microsoft Teams was launched in 2017, it’s an application dedicated to collaborative work between team members. This application facilitates sharing and collaboration. Available on any device, this application is built around instant messaging and allows to create work teams as well as personalized channels. Teams offers an important variety of tools, indeed it’s possible to pin files or web sites, use planning, exchange via a social network, manage your storage, organize meeting and many other things. You guessed it, Teams is an easy to use tool that simplifies teamwork. Since several months now, we know that Skype for Business will no longer be maintained by Microsoft. Thus, Teams will take over with different communication capabilities. You probably have a lot of questions: How to understand the integration of Skype for business in Teams? What differentiates these two applications? What are the common points? We will see that Teams is much more than a simple communication tool and that it reduces the number of applications. Don’t miss our Skype and Teams webinar on Wednesday February 27, 2019 at 4:00 PM (Paris Time Zone)! 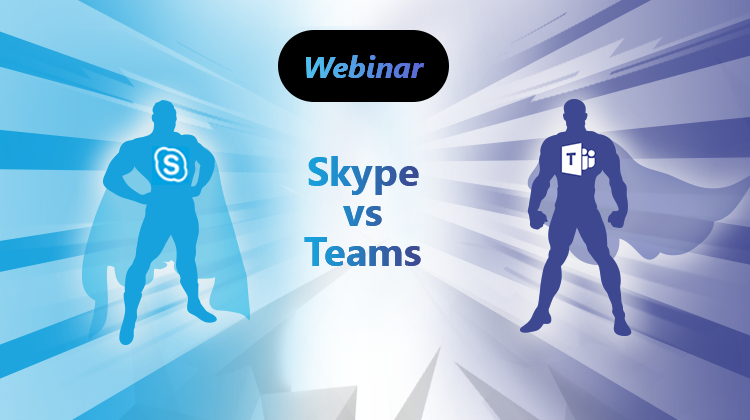 During this webinar, our expert trainer will start with an observation of communication practices in Skype then will present you the common points and differences between Skype and Teams. • Why Teams is not just a tool for audio/video calls? Feel free to ask any questions you may have on the chat during this webinar. We will answer you the next week in our blog post. Would you like to read an article on a particular topic? Ask us about it!